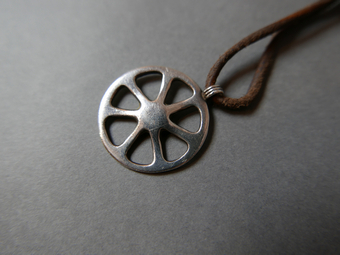 This is a sun-wheel, a replica of a piece of Viking jewellery. I had a sun-wheel before I met my wife. I held it in my hand and said to myself that I wished for a woman in my life… and then I met her… A few years later the sun-wheel got lost so my wife gave me a new one, hand-crafted by a silversmith. This one got lost, too - in Sweden, in the ocean – but my wife found it in the sand by diving for it. I have carried it with me every single day since then. This painting reminds me of the dunes in Denmark, where I sat and made the wish.